The area comprising Eritrea and Ethiopia has been in periodic conflict for decades and seems prime for resurgence due to drought conditions, economic issues and belligerent claims of land ownership. There are a number of areas along the border between these two states that are currently still at issue. The town of Badme is the critical point of contention since it is conflict in that border area that began the major conflict of 1998 – 2000. This town and others lie in the Tigray region which encompasses the origin of the founding Ethiopian empire, Aksum. The second main front on the border region is around Zalambessa further to the southeast of Badme. There are very complex ethnicities, histories, and cultures that are in conflict in the region and these fundamental differences are the reason for continued border tensions. Dispute settlement in the region of Ethiopian and Eritrean is ongoing, despite international agreements that define the border. Most recently, the conflict is changing as Ethiopia and Eritrea shift their resources to conflict in Somalia and conduct their dispute by proxy. Current trends toward religious extremism and violence in Somalia are resulting in serious distraction from resolution of the border dispute at the heart of Ethiopian and Eritrean relations. The establishment and agreement of defined boundaries will be the only way for these countries to create a legitimate framework for continued conflict resolution and dissuasion. Though both were ruled by the Abyssinian Empire, both the Eritrean and Ethiopian territories have varied and distinct histories. Ethiopia was never ruled by a colonial power and has always exercised a degree of self-determination in the region. Eritrea, however, has experienced a variety of occupations and subjugations over the centuries that have only, in the past decade, come to a close. It is important to address these different histories up to the 1950s, when colonial influence waned in Eritrea and the modern struggles began. Eritrea lies along the Red Sea in the northernmost area of the region known as the Horn of Africa. Ethiopia, however, is landlocked and has no direct access to any sea ports. As neighbors, they share some of the oldest archaeological discoveries in the world. These discoveries lie in the region of Tigray, now a province of Ethiopia, and historically a territory in both Eritrea and Ethiopia. The famed skeleton of Lucy, the Australopithicus Aferensis, was in fact found in this region. Influence over the region was directed from the Tigray capital of Axum and trade was conducted with the Arabian Peninsula by way of a port city, now called Zula, in Eritrea. In the 16th century, the Abyssinian Empire arose from Tigray and the whole of Eritrea and Ethiopia became subject to Abyssinian rule. Abyssinian rule of Eritrea was challenged at times, most notably by Ottoman and Egyptian powers, but generally speaking, Abyssinia ruled the whole of these regions for centuries. As indicated by this Rand McNally map from 1897, both Ethiopia and Eritrea were considered to be Abyssinian at the turn of the 20th century. During the long reign of Abyssinia, religion became an important influence and divided the empire. The Eritrean and Ethiopian cultures split into Semitic/Christian in Ethiopia and Muslim in Eritrea. These divisions should not be oversimplified and it must be understood that no two regions were then, or are now, exclusive in their religious composition. Broadly speaking, the highlands of Eritrea were occupied by the Christian elements while the lowlands where inhabited by the Muslim populations. Ethiopia, however, is one of the oldest Christian civilizations and to this day has one of the oldest Jewish communities. In order to understand the current conflicts and allegiances in the region today, the religious divide must be considered. The aggressive scramble for influence and territory with which to acquire natural resources on the continent of Africa through the process of Colonialism is a well known fact of African history. The Abyssinian Empire of the 18th century was no exception to these encroachments and the Eritrean lands quickly fell victim to the European invasion. The region known as Ethiopia today, however, was one of the only regions of Africa that did not fall prey to colonialism, although it was partially occupied by Italy from 1936-1941. Britain, France, and Italy all had incursions into the region of Eritrea during the 19th century, but the Italians would ultimately take control of large swaths of Eritrea. The first Italian missions into the region were during the 1840s, under father Giuseppe Sapeto, and resulted in the first acquisitions. Over time, Italy gathered influence and overtook the coastal region by 1885 and ultimately, under the Treaty of Uccialli (May 2, 1889), gained sovereignty. Through many conflicts, Italy exerted its military force until claiming Eritrea, Italian Somali-land and Abyssinia to be the new Italian East Africa. This Italian rule would last until the conclusion of World War II, when control would be succeeded to Britain and the UN would determine the resulting composition of the region. Upon exit from the region, Britain felt it would be necessary to divide up the region of Eritrea into Sudan and Ethiopia, but the United States pushed for federation with Ethiopia. The origin of this U.S. push was the new alliance they had built with Ethiopia. Ethiopia agreed to support the U.S. war in Korea and sent approximately 3,518 troops to assist the U.S. in the conflict. 121 Ethiopians would be killed and an additional 536 in the Korean War. With Ethiopian support against the waxing power of Soviet aggression, the United States took action to support Ethiopian interests in the UN commission entrusted with the Eritrean sovereignty decisions. Ultimately, the US opinion won out and Eritrea became an autonomous federated unit of Ethiopia. Unfortunately for the region, the influence peddling of the west, as well as new inroads by the USSR, would continue in many ways throughout the remainder of the 20th century. It is important to understand that the Ethiopians see themselves and the Eritreans as the same people and felt they were a benevolent presence. An Ethiopian cab driver who had recently immigrated to Washington D.C. recently told me, “They are our brothers, they are family. They should be part of Ethiopia and are not a separate country.” As evidenced by the vote in April 1993 for independence, however, 99.8% of Eritreans feel that they are a separate country and a different people who have a right to govern themselves. After Ethiopia adopted Eritrea as a federated unit in 1952 with the support of the United Nations, Eritreans could not help being concerned with their new situation. Ethiopia had a long history of enslaving and abusing the populace of Eritrea and people did not see the new federation as a benevolent arrangement. The Emperor Haile Selassie of Ethiopia ensured his tight control of the new federation by appointing relatives as the first three governors. A variety of oppression measures were taken in the federation. Eritrean political parties were banned, freedom of the press was disallowed, teaching in indigenous languages was forbidden and replaced with the Amharic language of Ethiopia. In the face of protests and boycotts, the Ethiopian government dissolved the federation and annexed Eritrea, declaring it to be the 14th province of Ethiopia. Following WWII the United States sought and received help from Ethiopia in the Korean War. The concurrent support of the west for Eritrean incorporation into Ethiopia is understood by many to be part of the agreement for Ethiopian supportin the Korean War efforts. The United States continued to stay in a supportive role for Ethiopia as the Soviets began aggressively supporting the rulers in Somalia. The front of the Cold War had officially begun in the Horn of Africa. During the early 1970s the United States was heavily funding the Ethiopian government in order to stave off the Soviet funded enemies in Somalia. A conflict of great proportions named the Ogaden War occurred through this proxy arrangement between Ethiopia and Somalia from 1977-1978. The funding is not to be mistaken for infrastructure improvement, but was directed almost exclusively to military program development from small arms to tanks and explosives. During the period of the Ethiopian-Somali war the military support flip-flopped as the Soviets agreed to support the Mengistu regime in response to lacking promised support by the United States. Consequently, the US began supporting the Somali regime. The military support of Ethiopia during the 1960s and 1970s led to unfortunate aggression on the Eritrean front as well. The capabilities engendered by outside support cannot be understated and the effects on relations in the region are still felt today in the wider Horn of Africa region. In most recent reports, Somalia appears to be sliding into chaos and is bordering on war that could engulf the region. Eritrea is a region that was affected greatly by colonial and other powers in the Red Sea region while Ethiopia was never directly ruled by colonial powers. The difference is key in the modern tension. After Ethiopia adopted Eritrea as a federated unit in 1952 with the support of the UN, Eritreans felt a perceived oppression immediately because Ethiopia had a long history of enslaving and abusing their populace. Ethiopia quickly asserted its powers by banning Eritrean political parties, censoring newspapers, and changing the accepted teaching languages. In 1962, Eritrea was annexed in its totality by Ethiopia. In the early 60s the Eritrean Liberation Front (ELF) was formed to start a guerrilla movement against Ethiopian hegemony in the region. Local and regional strength increased as mistreatment of Eritreans compounded but the most recognized and galvanizing event for the ELF was the hanging of 56 students in Asmara in January of 1975. Enrollment in the guerrilla movement accelerated and eventually they could number their membership in the 20,000s. The ELF was only the southern component of guerrilla factions however and the EPLF was created in the northern regions of Eritrea. Though these forces were both opposed to Ethiopian rule, they fought for resources and engaged in a civil conflict during the early 1980s. Eventually the EPLF won the contest as they acquired a variety of heavy war materials such as tanks, vehicles and more advanced weaponry. Fortunately for Ethiopia, the Soviet forces were funding them by the late 1970s and support was used to prevent greater territorial losses to guerrilla factions. The Mengistu regime prevented badly needed food aid distribution to the Eritrean and Ethiopian border regions, contributing to massive migration into Sudan. 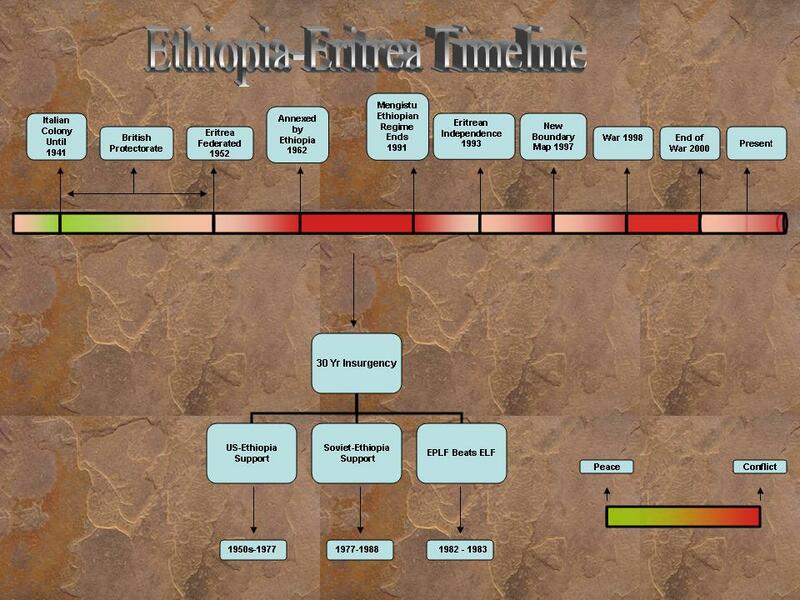 Due to the waning of the Soviet communist regime, the aid to Ethiopia evaporated as the Soviet bloc disintegrated. Eritrean fighters quickly took advantage of the declining Soviet support and gradually reoccupied strategic cities and regions of Eritrea. The Haile Mariam Mengistu regime was ousted by the Ethiopian People’s Revolutionary Democratic Front (EPRDF) in 1991 and Eritrea was granted rights to its own government. The long war between Ethiopia and Eritrea had exacted a high price in lives, health and infrastructure. It is estimated that Eritrea had about 60,000 deaths, 60,000 disabled and approximately 50,000 abandoned children during this conflict. The battles between Ethiopia and Eritrea were thought to be over for nearly a decade when things took a turn for the worse. In May of 1998 Ethiopians moved into the Badme region on the border and evicted thousands of Eritreans from their settled lands. Eritrea responded by sending a small contingent of military officers to the region, unarmed, in order to discuss the situation. These soldiers were summarily shot and the war had begun. This conflict was much more severe and deadly than any of the previous conflict. This was due to many factors. At the conclusion of the conflict, the UN sent in 5000 peace keeping troops that were to maintain the borders that were still, at the conclusion of conflict, in contention. This fact is why there exists so much potential for conflict today. Although the conflict is technically concluded, there are a variety of indications that this is not the case. There are still currently United Nations peacekeepers in the Badme region along the border zone. There were reports in late 2006 that Eritrean troops had made military moves into the contested border regions. Although there has been no response of international note, it is a bold move on behalf of the Eritreans. Even with these moves, however, the real threat is the proxy conflict that appears to be developing in the Somalia region. Somalia has long been an unstable region and is closely watched by the U.S. State Department because of ties to terrorist activities. A fundmantalist Islamic surge has pushed the moderate leadership to far western positions in Somalia and the predominantly Christian nation of Ethiopia has understandable concerns. Eritrea, however, welcomes the change toward Islamic leadership and is backing the power-grab of the fundamentalist factions. As both Eritrea and Ethiopia pour weapons and support into Somalia, so too do other nations such as Iran, Syria, Sudan, and other Islamic regimes. The conflict over the Eritrean and Ethiopian border could wait in the wings until developments in Somalia create a more advantageous environment for aggression. The annual expected rainfall of Eritrea is 380mm and Ethiopia is 848mm. Ethiopia has three main regions: cool on the plateau regions, temperate in elevations between 1,500m and 2,400m above sea level, and dry in the lowlands. The lowland regions are some of the hottest regions in the African contintent. Eritrea, however, has a very large arid area and relies on limited highlands in the west and northwest for agriculture. These areas are along the contested border with Ethiopia so it puts the conflict and the reasons for the conflict in a better perspective. Ethiopia is fortunate when compared with Eritrea and maintains twice the arable land area as Eritrea. 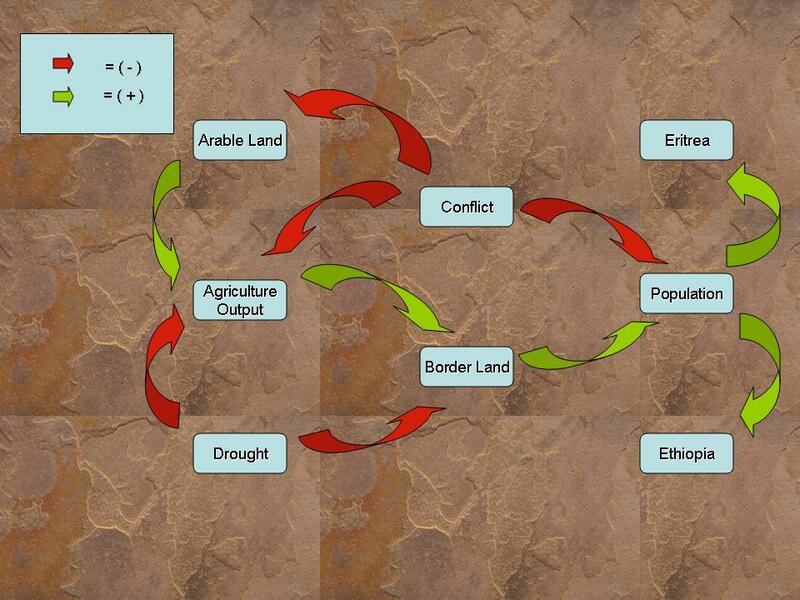 The environmental impacts of the sustained historical conflicts and the current tension are many. There are environmental problems that affect the habitat of people and the culture of people as well. During conflict and war, countries are forced to divert resources from economic and social utility to war utility. This shift in resources always puts a great strain on the general population but in East Africa, the impact is especially great due to the lack of total resources present. When resources are diverted to support war, the people are left to rely more on natural resources and are often forced to increase deforestation and develop land that would otherwise remain unaffected. The environment of East Africa makes agriculture a very risky and inconsistent activity that can be very successful in one year and nearly non-existent in the next. Rain can be very inconsistent, with some regions not getting enough and others receiving too much. For example, in autumn of 2006 there was massive flooding in East Africa and many crops received an over-abundance of water. The problems along the border regions are exaccerbated because people are traditionally accustomed to being able to travel in and out of territories to gather the resources they need. Rainfall: The annual expected rainfall of Eritrea is 380mm and Ethiopia is 848mm. 6.National Public Radio. Audio. http://www.npr.org/templates/story/story.php?storyID=1075257. 14. Washington D.C. Cab Driver. Recent Immigrant of 4 years. 16.Mebrat Tzehaie. "History of Eritrea". http://home.planet.nl/~haus.mebrat/eritrea-history.html.